Falls cause bone fractures. So do accidents. A bone fracture is a medical condition in which a bone is cracked or broken. Many fractures result from high force impacts or stress. Bone fractures also develop from medical conditions that weaken bones, such as osteoporosis, certain types of cancer, or osteogenesis imperfecta, which is a congenital bone disease that causes bones to be extremely brittle and fragile. In a closed fracture the skin is intact. An open, or compound fracture, involves wounds that communicate with the fracture and may expose the bone to contamination. 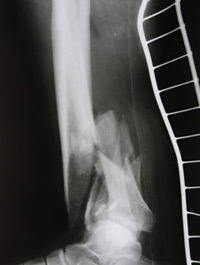 Open fractures carry a higher risk of infection, require antibiotics, and usually require surgical treatment (debridement), to remove dirt, contamination, and dead tissue. A simple fracture occurs along only one line. It splits the bone into two pieces. Multi-fragmentary fractures occur when the bone splits into multiple pieces. Compression fractures occur when the front portion of a vertebra in the spine collapses due to osteoporosis. A bone fracture may be very painful due to the stimulation of nerve receptors, swelling, and muscle spasms. Since bone healing is a natural process, fracture treatment aims to ensure the best possible function of the injured part after healing. Typically, fractured pieces of bone are restored to their natural positions, with verification provided by an x-ray. A fractured limb is held in place with a plaster or fiberglass splint. Once the initial swelling goes down the fracture may be placed in a cast or a removable brace. Setting the fracture called reduction and immobilization in a splint or a cast this may require anesthesia if the fracture is displaced. Percutaneous fixation: If the fracture is unstable with a cast but is reducible, then a less invasive percutaneous fixation can be performed. This involves inserting metal pins through the the skin to fix the broken bones. Open Treatment: This is open surgery were the bones are reduced to their natural position and fixed either with a plate and screws or a rod. This is usually necessary in most joint fractures that require anatomic reduction to decrease the risk of developing future arthritis and pain in the joints. Surgery is done only if conservative treatment has failed, or is likely to fail. Surgery is routine on hip fractures due to osteoporosis. That’s because the complications of non-operative treatment includes deep vein thrombosis (the formulation of a blood clot in a deep vein) and pulmonary embolism (a blockage in an artery due to air, fat, blood clot, or tumor), which are more dangerous than surgery. When a joint surface is damaged by a fracture, surgery is also commonly recommended to make an accurate anatomical reduction and restore the smoothness of the joint. These symptoms can indicate compartment syndrome which requires immediate release of the cast at the doctors office if it is during office hours or at an emergency room.